In the Tate Rothko Room 3 there is a somber atmosphere. The walls are gray and the lighting dimmed to display Rothko’s large canvases in maroon, dark red and black colors. I sit for a while. Into my ears, courtesy of the audio guide, a bit of Morton Feldman’s Rothko Chapel – Why Patterns? is playing. Ah, I think I understand this thing called art for a moment, but it is fleeting. Back to reality and Michelangelo Pistoletto’s Venere degli stracci or Venus of the Rags. During the Wainwright Coast to Coast walk, the Rothko moments came in the North Yorkshire Moors as we climbed up and down over moors like Danby and Glaisdale moor (day 11) which I remember in particular as we made our way from Blakey Ridge to Grosmont . On the previous day on our way from Osmotherly to Blakey Ridge we went up over Carlton Moor past a (former) gliding club hut and then down to the Lord Stones Café (for a bacon and egg sandwich lunch!). The scenery was more spectacular than I had anticipated. Part of the challenge on this trip was using my Canon Powershot SD1400 effectively. Perhaps it’s a user issue, but I couldn’t get the camera to capture the big open skies and expanses of heath. The camera seems to work well for macro shots and well-lit, smaller-framed shots. For the landscape shots, I found I gravitated to the Miniature Effect which the manual says “blurs chosen portions in the top and bottom of an image to produce the effect of a miniature model.” It tends to heighten the colors as well. 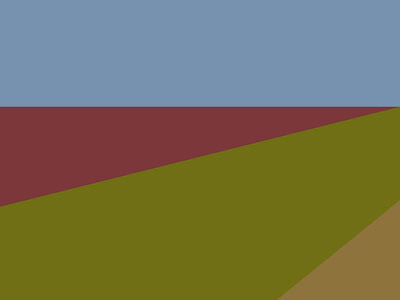 My Canon Rothko effect; it captured the scene the way that spoke to me about what I saw. 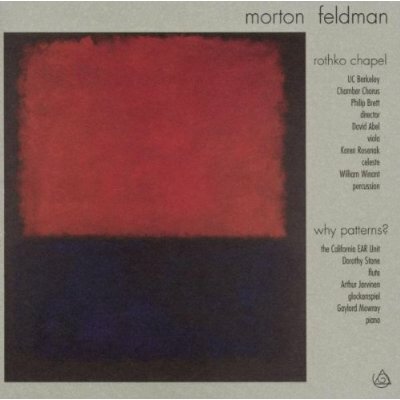 The Cover of Morton Feldman Rothko Chapel – Why Patterns? isn't it funny how nature inspires art? what a great tie-in. i think for the breath landscape shots you need a wider angle lens OR a bigger lens camera. i know what you mean tho by getting the breath of the landscape. it's very hard to do an it's why the big boys get paid for it. maybe that's why landscapes are often painted...that last photo looks really good. is it minitured? i tend not to like the minature effect MUCH. occasionally it produces some interesting results, like shooting a swiss village with rolling green hils (the houses are in sharp) then they look like a train set! it's weird like that.